Cambridge University Professor Peter Wadhams said the rapidly increasing pace of summer ice melt is such a “global disaster” that humankind must urgently study other methods to thwart global temperature rise. “Climate change is no longer something we can aim to do something about in a few decades’ time, and that we must not only urgently reduce CO2 emissions but must urgently examine other ways of slowing global warming,” he said in an email to The Guardian. Wadhams’ comments came as information compiled by the National Snow and Ice Data Centre (NSIDC) in Colorado showed that in early September, with at least one more week left in the melt season, Arctic sea ice extent was continuing to drop and was below 4.00 million square kilometres. “Compared to September conditions in the 1980s and 1990s, this represents a 45% reduction in the area of the Arctic covered by sea ice,” a NSIDC report noted, adding throughout August, Arctic sea ice extent tracked below levels observed in 2007, leading to a new record low for the month of 4.72 million square kilometres. 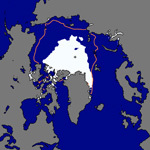 On 26 August, the report said the five-day running average for ice extent dropped below the previous record low daily extent, observed on 18 September, 2007, of 4.17 million square kilometres. The report added the rate of ice loss for August this year was 91,700 square kilometres – approximately the size of Portugal – per day, the fastest observed for the month of August over the period of satellite observations. In August 2007, the previous record loss, ice was lost at a rate of 66,000 square kilometres per day. Noting that ice age is an important indicator of the health of the ice cover. the report said that between mid-March and the third week of August, the total amount of multi-year ice within the Arctic declined by 33%, and the oldest ice, ice older than five years, declined by 51%. In a different but related Guardian article, Kumi Naidoo, director of Greenpeace International, said the rapid decline of Arctic summer ice is a defining moment in history. “In just over 30 years we have altered the way our planet looks from space and soon the North Pole may be completely ice-free in summer,” he said. Rémi Gruet, the European Wind Energy Association’s Senior Regulatory Affairs Advisor for Climate and the Environment, said the summer Arctic sea ice melt is one more sign that climate change is happening faster than expected. “With energy representing 60% of world greenhouse gas emissions, and 70% in the EU, solutions in that field need to be massively and immediately rolled-out,” Gruet said. Steve Sawyer, the secretary general of the Global Wind Energy Council, said the melting Arctic ice pack along with other stories highlighting global warming have put the climate issue back at the top of the public agenda. Sawyer also said the “climate is changing faster” than the positions of international negotiators trying to reach an agreement on reducing greenhouse gases that cause global warming.